I thought it a fun, great idea since I use a notebook to plan my week and make notes. 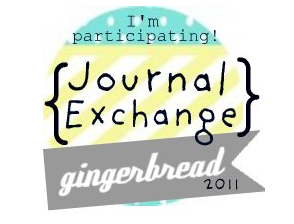 And I actually have a journal that's ready to use, but I wanted to embellish it and wasn't getting any ideas. So for the past few weeks I've been on the look out and finally I found a cute notebook at Target! 2. it's monogram...comes with letters and even a few graphics! Then I remembered my first Pick Your Plum purchase and the crafty light bulb came on!! The suede piece I've had for a long time, can't even remember why, where, or what. And the ombre ribbon came from a floral/gift shop that I used to work at and is actually floral ribbon but it's orange and unique and that's why I have it! After playing around with where I wanted what to go I busted out the hot glue gun and started gluing! First I weaved the tiny pink ribbon in the grommets of the suede strip and lightly glued the ends down. Then I glued the solid orange ribbon to the straight edge of the suede. Next I added the ombre ribbon next to the solid orange and glued my now orange with pink suede strip to the notebook. Finally glued down the flowers to the bottom right corner of the initial. What do ya think? I think K is for Kute!! See my Link Parties Page for where I like to party! What a great idea! Super cute little notebook! Great job, friend. You are so talented! The notebook turned out so great! I love all the pink! What a great idea and the embellishments are just perfect! oh, and I'm loooving all the pink pride! Gorgeous notebook those flowers just make it pop! how cute! I love journals, though I haven't actually journaled for real in forever. I like the idea of fixing one up though. looks perfect. i want one just like it:) but am so not talented enough to make one. you rock girl!! That is super "kute"! Now you've given me some inspiration! Love the ribbon you used - seems easy enough! Thanks for linking up to my blog hop!! Super cute Jennifer! Feel free to make me one now ;D Haha! Thanks for linking this up at H&H's link party!